Pay tribute to your hometown and/or celebrate your wedding destination! 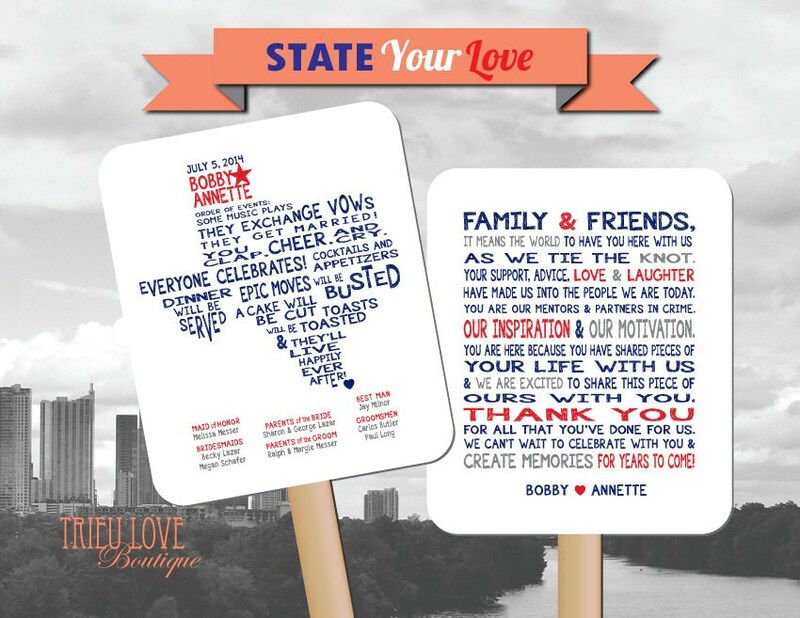 A completely customizable double-sided State shape wedding program fan that will be 5.5" x 6.5" (plus a 3" handle). You can have anything you like written in the shape of your choice and on the back! Change any or all of the wording to suit your special day. If you are looking for something simple and sweet, this is it. Your guests will enjoy reading through this fun State program, and cool down in the hot weather. >> MORE SHAPES: I can also do Canadian provinces, or any town or country shape of your choice too, just Convo me to inquire. Most shapes will fall under this listing price but if I find your requested shape is more complicated an extra fee of up to $25 may apply, you can ask me first to make sure your request is doable or if it will cost more. Small islands (like Hawaii) cannot be done.